John Moore; Male; 55; Auctioneer Etc; Born In Gloucestershire. Mary Moore; Female; 50; Independent; Born In Gloucestershire. Thomas Weaver; Male; 45; Auctioneer; Born In Gloucestershire. Elizabeth Phillips; Female; 35; Female Servant; Not Born In Gloucestershire. Harriet Stone; Female; 13; Female Servant; Not Born In Gloucestershire. Blanche Ann Holland; Female; 1; Infant; Not Born In Gloucestershire. James Horniblow; Head; Married; Male; 59; Undertaker & Mourning Establishment; Born Severn Stoke Worcs. Johanna Horniblow; Wife; Married; Female; 55; Undertakers Wife; Born London. James Thorniloe Horniblow; Grandson; Male; 5; Schoolboy; Born Tewkesbury Glos. Mary Purser; Servant; Female; 23; General Servant; Born Hinckley Leicestershire. Samuel Davis; Head; Married; Male; 69; Hosier; Born Tewkesbury Glos. Alice Davis; Wife; Married; Female; 70; Housewife; Born Tewkesbury Glos. Eliza Davis; Daughter; Single; Female; 39; Dressmaker; Born Tewkesbury Glos. Eliza Davis; Servant; Single; Female; 16; House Servant; Born Toddington Glos. Louisa Vickeridge; Boarder; Single; Female; 16; Born Barnwood Glos. Joseph Williams; Head; Single; Male; 35; Williams Employing 9 Hands, Tailor And Linen And Firm Brotherge? ; Born Castle Morton Worcs. Elizabeth Brotherge (or Brotheridge); Housekeeper; Single; Female; 17; Housekeeper; Born Bredon Worcs. John Brotherge (or Brotheridge); Shopman; Single; Male; 23; Shopman; Born Bredon Worcs. Daniel Clinton; Apprentice; Single; Male; 16; Apprentice; Born Tewkesbury Glos. John Willis; Head; Married; Male; 53; Confectioner Employing 3 Boys; Born Winchcombe Glos. Sarah Willis; Wife; Married; Female; 57; Born Walworth? Surrey. John Willis; Son; Single; Male; 20; Born Tewkesbury Glos. William H. Willis; Son; Single; Male; 17; Born Tewkesbury Glos. Sarah W. Willis; Daughter; Single; Female; 14; Born Tewkesbury Glos. Amelia Minett Or Merrett; Servant; Single; Female; 21; Domestic Servant; Born Beckford Glos. William H. Wade; Boarder; Single; Male; 20; Wine Merchants Clerk; Born Kingston Surrey. Sarah Willis*; Head; Widow; Female; 67; Baker & Confectioner Employing 3 Men 3 Boys And 1 Shopwoman; Born Walworth Surrey. ****John Willis; Son; Single; Male; 32; Baker & Confectioner; Born Tewkesbury Glos. 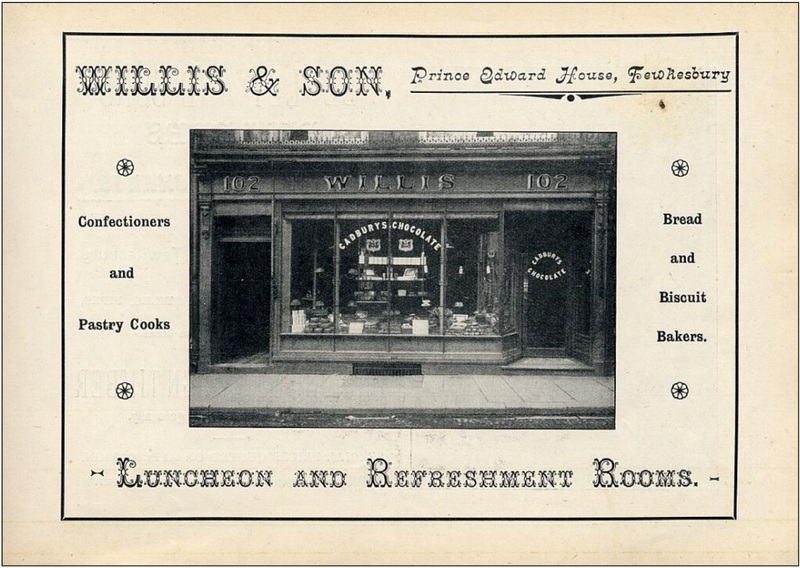 William H. Willis; Son; Single; Male; 27; Baker & Confectioner; Born Tewkesbury Glos. **Sarah W. Willis; Daughter; Single; Female; 24; Bookkeeper; Born Tewkesbury Glos. *John Benneworth; Visitor; Single; Male; 28; Wesleyan Minister Of Ludlow Chapel; Born East Berghold Suffolk. Rose Atkins; Servant; Single; Female; 18; Domestic Servant General; Born Tewkesbury Glos. died 30/09/1891 in Leeds: Sarah Willis, widow of late John Willis of Prince Edward House aged 78. (TREG 03/10/1891)Two Couples Married TREG 06/08/1881 p1/502/08/1881 at the Wesleyan Chapel, Rev. John Benneworth* of Ludlow to Sarah Wood ("Sissie") Willis**, daughter of late John Willis+Mary Jane ("Polly") Hayward*** to John Willis****. John Willis; Head; Married; Male; 42; Baker & Confectioner;b. Tewkesbury Glos; Employer. John Willis; Son; Single; Male; 8; Scholar;b. Tewkesbury Glos. Helen Mary Willis; Daughter; Female; 6; Scholar;b. Tewkesbury Glos. Dorothy J. Willis; Daughter; Female; 1;b. Tewkesbury Glos. Alice S. Bell; Servant; Single; Female; 27; Confectioners Shopwoman;Born Cheltenham Glos; Employed. Annie Wheeler; Servant; Single; Female; 26; Nurse;b. Turk Dean Glos. Ruth Wheeler; Servant; Single; Female; 21; General Servant;b. Turk Dean Glos. Two Couples Married TREG 06/08/1881 p1/502/08/1881 at the Wesleyan Chapel, Rev. John Benneworth* of Ludlow to Sarah Wood ("Sissie") Willis**, daughter of late John Willis+Mary Jane ("Polly") Hayward*** to John Willis****.